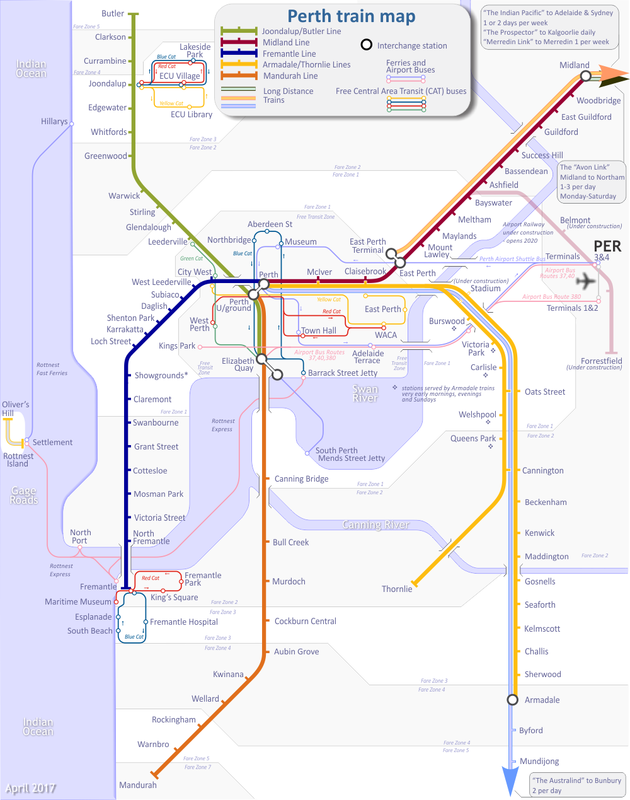 This map covers the metropolitan Perth region in the South-West corner of Australia. Perth, with a population of over 1 million, is a dynamic and wealthy city built on the profits from the almost boundless mineral resources of the State of Western Australia - the Texas of downunder. Perth proudly proclaims itself as the world's most remote city. Suburban trains in Perth are operated by Western Australian Government under the brand-name Transperth. There are six lines radiating from the downtown Perth station. After years of neglect, Perth's railway system was completely rebuilt commencing with the re-opening of the formerly closed Fremantle line in late 1983, then in the early 1990's the entire network was electrified and an entirely new fleet of trains built. 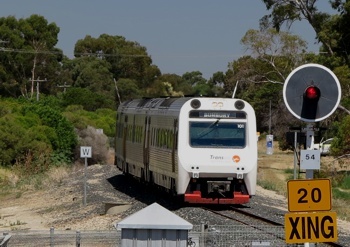 Two totally new lines have been constructed - to Clarkson in the late 1990s, Southwards to Rockingham and Mandurah in 2007 and in September 2014 further north to Butler. The system is impressively modern and it is possibly one of the most efficient anywhere. Trains are fast, comfortable, clean, safe, inexpensive and frequent. Just about everything you could want in a rail network. 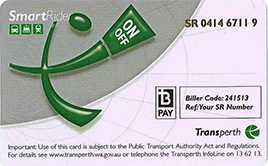 SmartRider is a reusable smart card, which allows easy, hassle free travel on Transperth train and bus services. SmartRider gives you a discount of 15%-25% off standard fares. 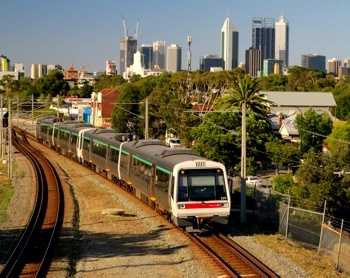 Find and book conveniently located Perth hotels online with Australian Rail Maps and booking.com. Book Online now. No booking fees. Pay the Hotel when you stay. TransWA's twice daily Australind trains southward to Bunbury arrive and depart from Perth station. TransWA's "Prospector" daily trains eastward to Kalgoorlie and Great Southern Railway's weekly "Indian Pacific" train to Adelaide and Sydney arrive and depart from East Perth Terminal station. TransWA's Avon Link trains shuttle between Midland and Northam connecting with electric trains between Perth and Midland.